Color 1822 Ash Blonde. The Wig Co Fashion Club Designs. Material: Heat Resistant Synthetic. Condition: 100%NEW. Quantity/unit: 1 pc. Quick way to change up your look. Short, layered style that will instantly make you look young and flirty. - Easy to take care of. Synthetic wigs only need to be washed every 6-8 wears. 1 Piece Hair Wigs. 【 length 】 : 76cm. · 1 x Premium Hair Hair Wig. High temperature wire wig can withstand the following high temperature 180 ° c, can not be hot dyeing, easy care, can be secondary modeling. 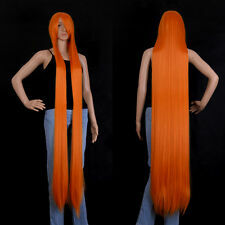 Fashionable and stylish long hair wig looks natural, real, very pretty and feminine;. Style: Long Curly Cosplay wig. Hair Length(Top to Bottom): 100 cm. If encountering peak season, it will be delayed. Hope you can understand. Can be hot dye (100-150 degrees). if encountering peak season, it will be delayed. Hope you can understand. Lace Wig Type:None Lace Wigs. The inner design is adjustable, so you are able to adjust the size for an ideal fit;The hooks inside the wig are fully adjustable to fit all sizes. Do not brush when wet allow wig to drip dry. Material:High quality HEAT RESISTANT(150C) Japanese synthetic fibre. Because these lace front wigs are hand-made, the color mixing could be done a little differently for each wig. Cap Type:Lace Front. Quick way to change up your look. Short, fluffy layered style that will instantly make you look young and flirty. Exercise and Fitness. Training Aids. It cannot be straightened or curled with heated styling tools. Color: Black Grey Gradient. (3)Do not brush when wet allow wig to drip fry. Features: heat resistance, straightened under 180℃. High quality material ensures its soft and smooth touch. All wigs are hand made by professional workers.The cap is stretchable. ◈ Eyeshadow, Concealer & Brush. (4)Do not brush when wet allow wig to drip fry. Use wig brushes, combs and other styling accessories. They make styling easier. ◈ Cell Phone Cases,Cover & Skin. Weight of wig: 125g. It cannot be straightened or curled with heated styling tools. - Easy to take care of. Synthetic wigs only need to be washed every 6-8 wears. 1 Pieces Hair Wigs. - Featuring a classic cap. Quick way to change up your look. Short hair so manageable and tangle free. Style: Full Wig. The hair is stitched on to a lightweight adjustable stretch head cap, simply adjust the wig to the correct size that comfortably fits your head. 🔥Platinum blonde. 🔥Dark root ombre wig. 🔥Comes with lace, slight modification to front lace. 🔥High heat resistant synthetic hair. 🔥Bob cut style. 🔥12 inches long. 🔥Has adjustable straps as well as 3 combs. 2 on Sides and 1 on top. 🔥Curly/wavy texture. 🔥This is a new, gently used wig. Worn once. Lace is cut off, but still can be customized. Did not pluck around the hairline. 🔥Free shipping. Brand: NAWOMI Material: Synthetic fiber of 100% Kanekalon Length: 30 cm Color: light brown (33H130) Weigth: 115 g (Net weight) Cap size: Adjustable up to 56cm head circumference Product Highlights: Breathable, was tied to braid. Looks very natural and feels like that. Comfortable wearing due to its light weigth.